St Wilfrid’s serves the villages of Great Langton and Little Langton and is situated between them. 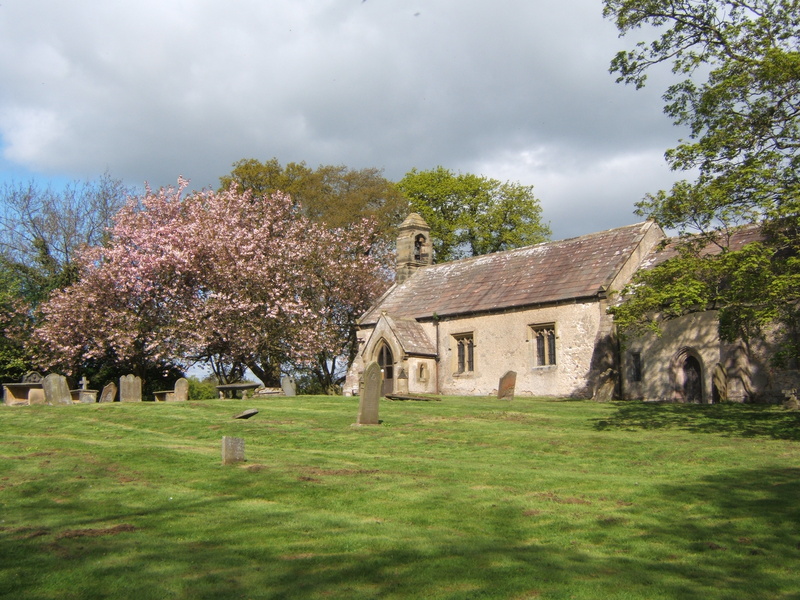 It is not known when the first church was built at Langton. This part of the country suffered much from the raids and ravages of the Danes. In the Domesday Book of 1086 the parish of Langton is described as having been laid waste. The present church stands stands by itself in the fields, reached by a grass track from the road along the east bank of the Swale. The large churchyard slopes away to the beck on the south. Standing at the church door there is not a single human habitation to be seen. Only the calling of the birds can be heard and sometimes the bleating of sheep or an occasional distant car or tractor. It is one of the most peaceful places imaginable. This isolated position has given rise to many speculations. It is sometimes supposed that an original village nearby was abandoned and destroyed after the Black Death in the fourteenth century. Be that as it may, the church stands exactly halfway between the two ‘townships’ which it serves, Great Langton and Little Langton. Services at St Wilfrid’s are held monthly, usually on the third Sunday of the month.